Unlimited means that the global settings are used. 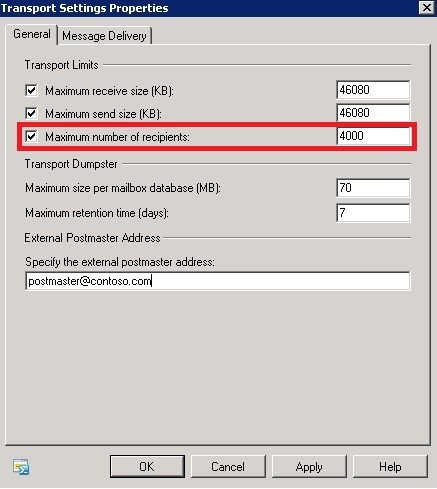 And what about mailboxes limits and the global limits ? Mailboxes limits always take priority over the global. And not just in the case of restrictions, but also bigger recipient numbers than the global limit. There is one other place where you should look when determining limits. Especially in environments migrated or coexisting with Exchange 2003. This limit can be changed by using the ESM for Exchange 2003 or Exchange 2007 (SP1) and Exchange 2010 tools. 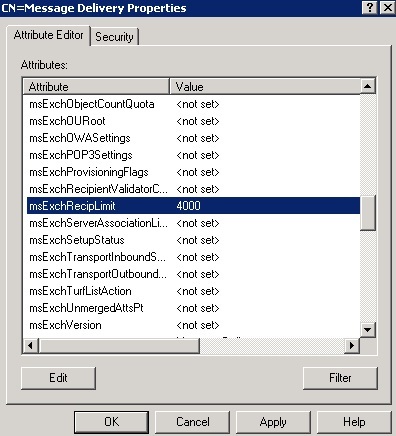 But after changing in the ESM EX 2003 the new value is not visible in the console 2007/2010. Unfortunately, it is used! In case of conflict, the lower limit is taken. Each member of the distribution group is treated as one recipient. 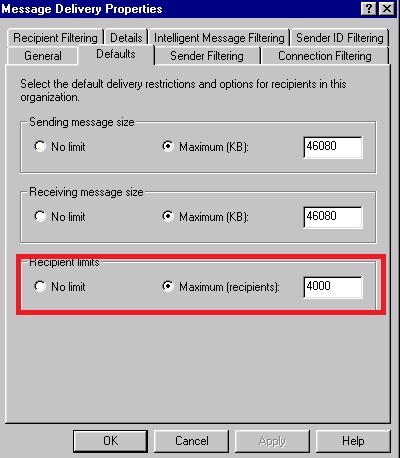 Tagged Exchange recipient limits, recipient limit. Bookmark the permalink. Do distribution groups count as one toward a recipient limit or does exchange count each member of the distribution group? I believe Exchange 2003 would count each member, but it appears that Exchange 2010 does not. It depends on Exchange version. Exchange 2003 and 2007 coutn each member of distribution group as a separate recipients. 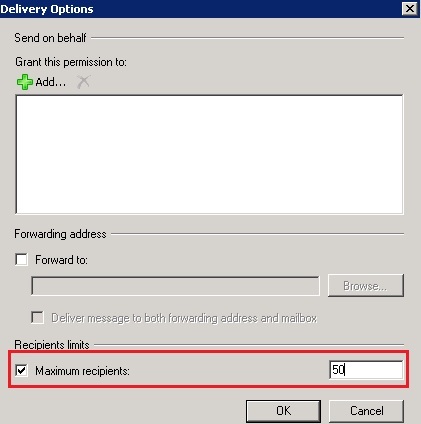 But for Exchange 2010 when you send email to distribution group it is resolved as a 1 recipient. With the exception of mailbox recipient limits, that has the highet precedence. Does Organization recipient limits overwrite any settings configured a the transport server and receive connector level? Does the MaxRecipientEnvelopeLimit = 5000 take precedence over the two other limits? Each level limit has different order of precedence. The mailbox level limit has the highest priority. 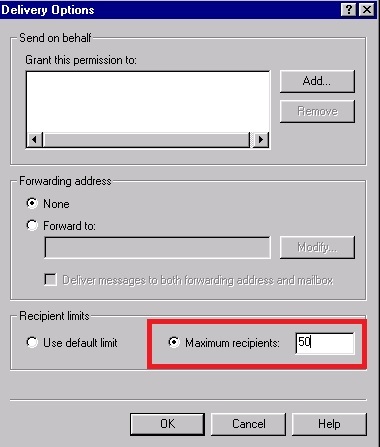 This restrictions are not applying for inbound mails. i.e., from external to internal. Do we need to do any extra configuration? 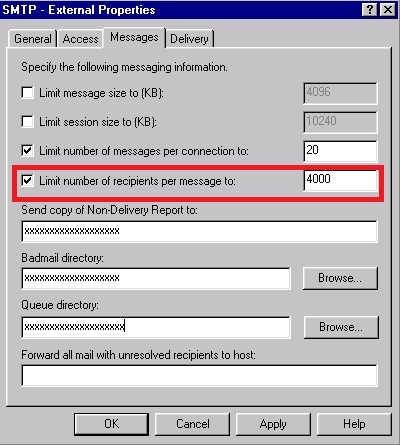 The above said limit only work for our internal users (outbound).